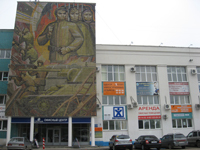 The Branch in Traktorozavodskoy District is conveniently located in the heart of this district, on Dzerzhinsky Square. Our address is 1 Dzerzhinsky Sq. (to the left of Traktorniy factory’s clock houses in a new office building). The Centre is situated in a beautiful comfortable office with the classrooms equipped with audio-visual equipment necessary for high-quality teaching. The library of this branch has all the necessary teaching and methodological resources, descriptive materials and hand-outs. The office is in the classroom № 202. We offer classes in numerous foreign languages including: English, German, French, Spanish, Italian, Chinese and others. We invite adults, school-kids and children from 2,5 years of age to our courses. Classes are conducted by qualified and highly skilled foreign and local teachers, who have an excellent knowledge of foreign languages, are experienced in modern methods of teaching and who are enthusiastic about their work. The branch has been successfully enjoying the employment of qualified teacher. Vladimir Vinaheras Hernandez is a teacher of Spanish (Bachelor with honors of Arts and Sciences, Institute of Exact Sciences ‘Lenin’, Havana, Cuba). Vladimir is fluent in Spanish, English and Russian languages. Our friendly and efficient managers are always ready to answer any questions you may have. Call: 98-65-50; 26-00-06.